ARRS vs. HIVE: Which Stock Is the Better Value Option? Investors interested in Communication - Components stocks are likely familiar with Arris Group (ARRS) and Aerohive Networks (HIVE). But which of these two stocks presents investors with the better value opportunity right now? Let's take a closer look. Currently, Arris Group has a Zacks Rank of #2 (Buy), while Aerohive Networks has a Zacks Rank of #3 (Hold). 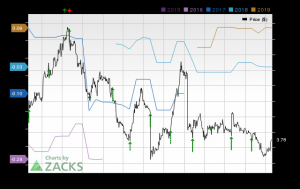 The Zacks Rank favors stocks that have recently seen positive revisions to their earnings estimates, so investors should rest assured that ARRS has an improving earnings outlook. However, value investors will care about much more than just this. ARRS currently has a forward P/E ratio of 10.20, while HIVE has a forward P/E of 38.82. We also note that ARRS has a PEG ratio of 1.57. This popular metric is similar to the widely-known P/E ratio, with the difference being that the PEG ratio also takes into account the company's expected earnings growth rate. HIVE currently has a PEG ratio of 1.76. Another notable valuation metric for ARRS is its P/B ratio of 1.86. The P/B ratio is used to compare a stock's market value with its book value, which is defined as total assets minus total liabilities. For comparison, HIVE has a P/B of 8.80. These are just a few of the metrics contributing to ARRS's Value grade of A and HIVE's Value grade of D.
ARRS stands above HIVE thanks to its solid earnings outlook, and based on these valuation figures, we also feel that ARRS is the superior value option right now. HEAR vs. HIVE: Which Stock Is the Better Value Option?